Look DPM, we just sent off our founding PM yesterday and I was hoping for a break to get on normally today and for many days. Don't do something so careless. Repeatedly disappointed with you despite you being one of the nicest guys around. I received multiple copies of this picture yesterday and they told me this lovely rainbow appeared after the heavens emptied on us. But I told each to them to look carefully at the photo. The rainbow happened years ago. Noticed Gardens by the Bay wasn't in it. This DPM is still as careless as making the mistake that nurses are menial workers in his population white paper. Damn it. Just only one day after and this government already gives me reason to criticize. You must exercise better judgement DPM Teo! We all came together to send off Lee Kuan Yew. Everyone have their common public reason and private personal one for doing that. 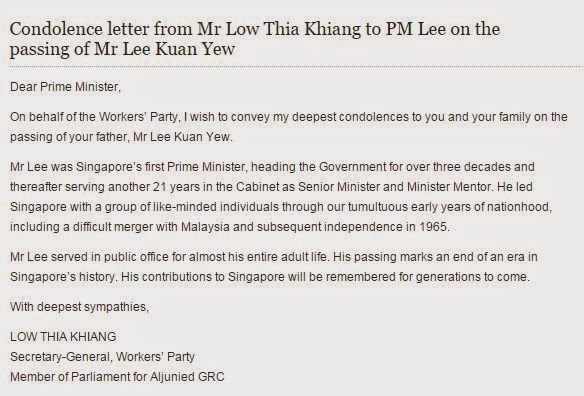 I am sure some of us rue that we no longer have a leader like LKY and have to live with the likes of you. As a consolation, at least we have another much better DPM in Tharman. If the government is first class we will not be stingy with our praise and support but.....better not say. Kissinger: LKY was a very meticulous person. Well you don't need to be as meticulous but there is a minimum attention to detail to avoid mistakes. I have heard too often from people that our government is becoming sloppy. An excellent profile pic from the PM. We carry on with our lives, not as noisy as we normally would do but quietly. You don't flip the switch with matters like these. You transition. The nation is in grief, the PM just lost his legendary father and here the Israeli President wants to talk business. This is totally surreal to me but I better wake up my idea. The Israelis are out in front telling us, we like them are tiny and have to be tough. Thank you Israel. With LKY gone, history teaches us that others will test us. Unlike others Israel offers us a friendly test which can only make us stronger. 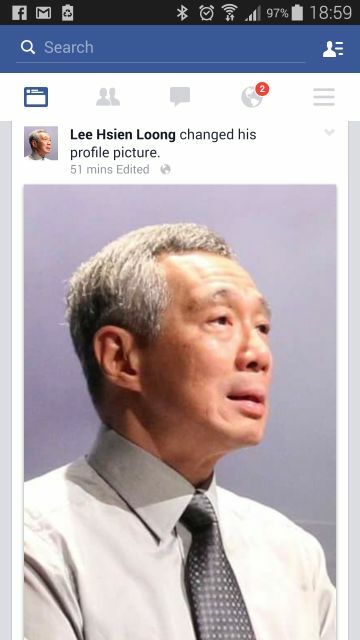 I sympathize with PM Lee. Even in his greatest personal loss, he has to put Singapore first. Israel has come to remind him that. We need to be tough to survive. We welcome the tutorial from Israel to prepare ourselves for our frenemies testing. 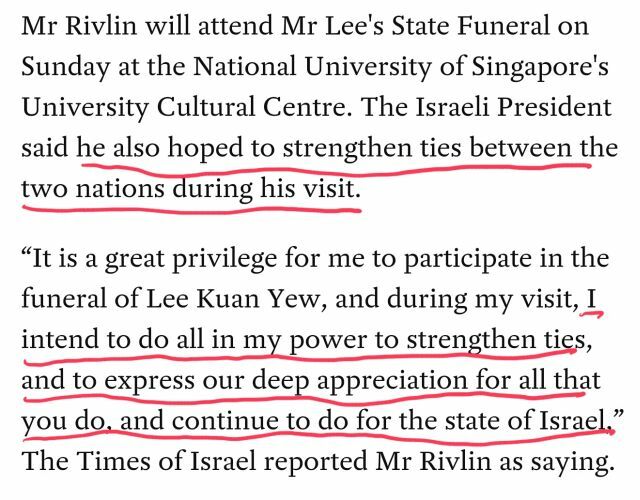 Just in case we are weak, Lee Kuan Yew has bought us time to be strong before he left from the goodwill he had built for us. The unthinkable long queues waiting to say good bye to him at Parliament House send the strongest signal to the world our resolve to carry on successfully without him. I am not sure if I still blogging for myself only. Grateful to former MP Peh Chin Hua and CCTV for this. Over the last few days, my mind has been in overdrive over LKY. I have done very little work and now the pieces are falling into place, coming together. Conundrums are giving way to ideas and solutions. Things are starting to clear up. It is sad that it took his passing away to create the right emotional cauldron to make these thoughts surface. I am learning very rapidly, faster than I can record them. I never consider what I write on this blog as sharing. After all I am blogging for myself (and family). Going to Parliament House to honor LKY as he lays in state is not my style. Were he able to talk to us from the beyond, I imagine he would say we are wasting our time. We should just get on with the business of tomorrow. On the other hand I understand people feels right, in fact they feel a deep need and desire to send him off. I want him to live with us in the spirit through his words. 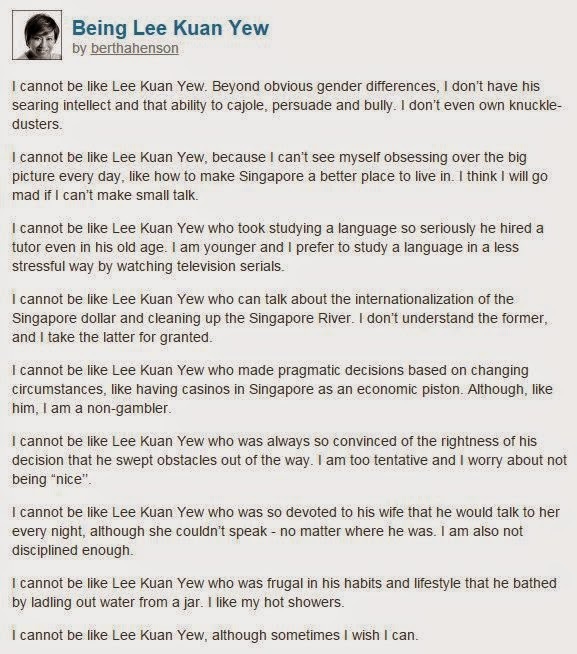 Bertha Henson began each line, "I cannot be like Lee Kuan Yew..." She is absolutely right. But each of us can be a bit of LKY in ways we are born and nurtured. Pick your choice from Bertha's list and develop them. 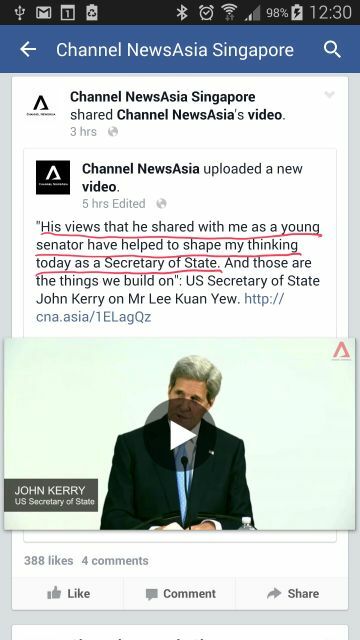 Together we can be Lee Kuan Yew and because LKY is Singapore. We cannot just rely on the PAP. In the short to medium term we cannot count on the opposition parties either. And LKY is also complex enough (read rich enough) to be interpreted and understood in myriad ways. Whatever we do with this just don't do it stupidly like the Chinese worshiping Mao, who to me is a monster however much the Chinese needed him to free them from their past. 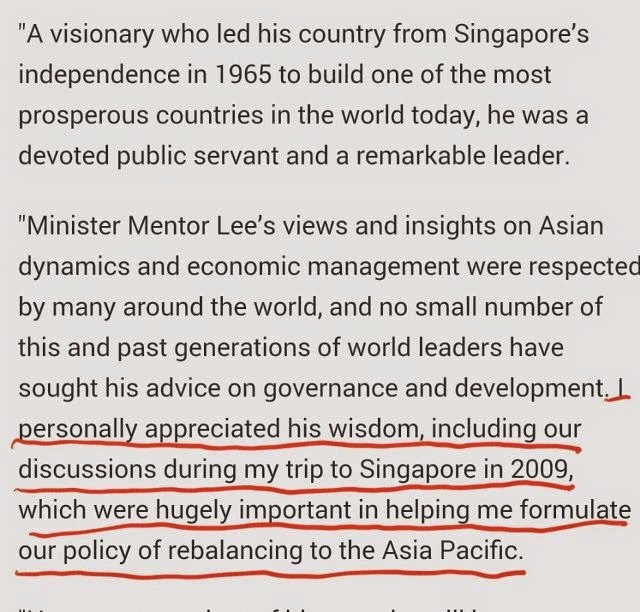 But in an earlier post I said LKY is also a conduit from which I could draw in the richness of knowledge, ideas and experience beyond Singapore. What do I mean? I am shamelessly going to borrow it from my Christian faith which allows me to find a way for him to live among us even if he is gone. I am not explaining it here, not yet. Too difficult. Now what works with LKY will also work for GKS, but LKY is the final piece to bring together all the other pieces from the works of former colleagues. Until he goes away, I simply couldn't get it. Can you imagine a US President sitting in the room Thomas Jefferson once thought and wrote? He goes in there for inspiration. Actually he goes in there to feel in a certain way to help him think. Let's do the same in our own way with LKY. We desperately need to as the PAP is good but not good enough. Thanks once again to General Prem for his advice to continue working on what LKY could not complete. 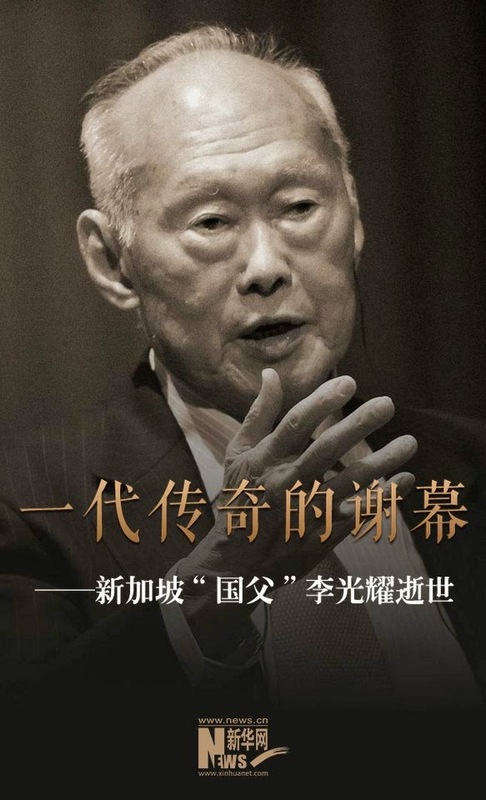 The best tribute we could give Lee Kuan Yew is for a part of him to live in each of us and make Singapore a success for a very long time to come. I don't know how we can be successful otherwise. I forgot to add that we must learn not to detain the innocent without trial under our security laws unnecessarily. There must be due process and ways for them to be protected if they have to be locked up for a while. I took this from Asiaone article. Hope this advanced a little toward helping doctors be less money minded too, "affordable healthcare"
I know I have company whom I do not know. I am glad to be able to name at least one - Tong Ming Chien. Some of us with this perspective would need to guide or lead many of those who showed up at parliament house. Nevertheless I am truly glad those who wanted to bid him good bye for the last time had the opportunity to. We must respect that we are all different people with different ways and needs. Many lived in the present, a few are always casting their eyes ahead. I really appreciate what former Thai PM Prem had penned in his condolence message. "The things he wanted to do for Singapore but was not able to complete, the Singaporean people must come together to finish" he wrote. On the surface this is a most unusual message. Didn't LKY already meticulously set up for a new team to take over? Prem did not say what were the tasks to be completed, objectives to be achieved but he suggests there are! There are insights but not knowledge or data I do not tell my children before they are ready. There are also lessons they must or can only learn on their own. I know what these are but I have to keep them to myself. If I tell them they might not understand or I could also spoil it for them. If I may borrow from Luo Guanzhong, the Romance of the Three Kingdoms, Zhuge Liang often gave sealed instructions to his generals which they must not open until they are desperate. Unlike many Thai premiers, Prem is a very wise man and knew LKY well. This is not the place to speculate what these tasks we must complete as a people but clearly Prem must have understood they are what this PAP government could not deliver. We must also bear in mind the situation in Thailand which must be constantly on his mind even as he offer us that advice. 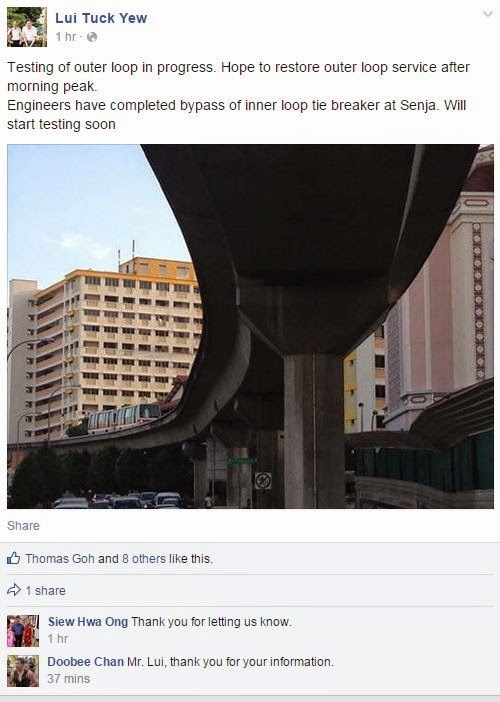 Of course this is not it, but one of the things the government cannot deliver quickly and satisfactorily is getting the damn MRT system to be more reliable. I suggested in an earlier post that a more courageous leadership would have come clean and co-opt their customers to find a solution. This is an example but I say this is not what Prem had in mind, that we must come together as one people to solve. We also know that if any of the young ministers could be a geopolitical strategist par excellence, LKY would not fail to invest in him or her. There was no one, not even George Yeo. So he kept performing that role of watching out for Singapore to the very end. 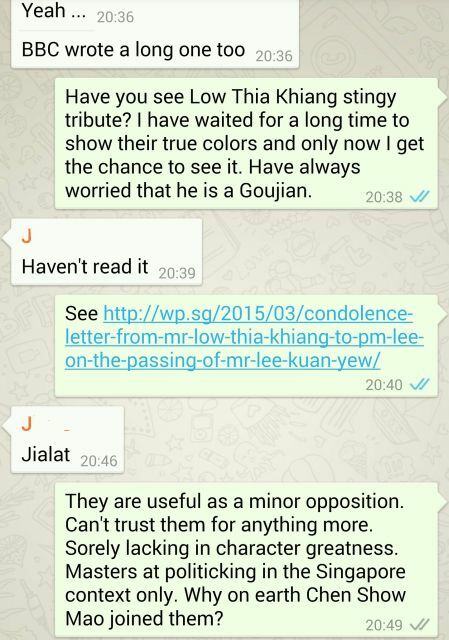 As far as I know nobody ask to see someone else if LKY is not available. It is like I can't get the top specialist doctor I had to settle and worry about living with the next available doctor. I might go somewhere else. The Americans will ask Kissinger. That shrewd man just visited China and got an enviable reception from Xi Jinping. Kissinger is sending a message to America, no more LKY just ask me. Now I need to prove that there are some likely worrisome and even scary developments otherwise I am just speculating. For that, I have to borrow Han Fook Kwang. He is a good guy but I don't know why they got a dud to succeed him as ST editor. On Tuesday, Han Fook Kwang shared this piece with us. This guy is quite good at inserting ideas surreptitiously when he needs to. If you are perceptive Han Fook Kwang has the message. You are naive if towards the end you assume the LKY when he was still strong and vigorous, able to intervene like he did when the SIA pilots union had problems in 2003 (read he was no longer PM and yet he had to step in) is the same guy who losing physical stamina and emotional vitality would pick fights. No, he will adjust. Before he got too weak he gave up on rising from the grave if he feels something is wrong here. He replaced that with he had given his whole life for Singapore. The job is finished. See the bit underlined in red. He was still in good shape at that time. After all he took on the SQ pilots union but he was no longer PM. Had he been the one which the buck must stop with him, he would tell us what Goh Chok Tong wouldn't. He will deal with it his way. 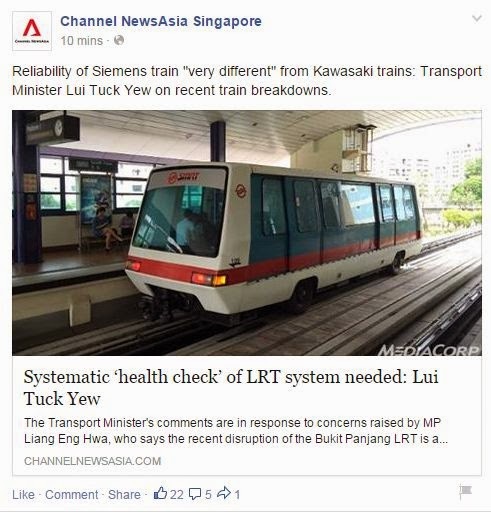 If he was in charge as PM today, he wouldn't even allow the MRT to be in this shape. In fact he warned his son and the ministers about the problem of taking in too many people, not to mention so quickly. Assuming he booed booed, he would not live with a situation which the people ceaselessly complain about the unreliable train system. If he can't fix it quickly, he will plead with us once and for all to come along and help. He knows how to rally us. His successors do not. 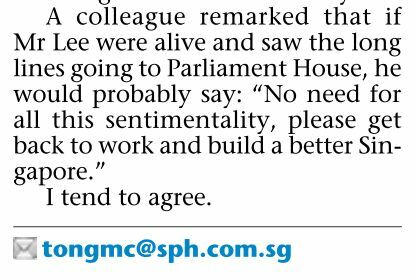 He told his younger colleagues to under promise and over deliver, which I heard on TV Ng Eng Hen repeated in parliament just now. Unfortunately those who succeeded him over promise and under deliver. Whenever the PM or any minister say "don't worry", I start worrying. That is shorthand for over promising! Yes, Prem is spot on,. We must unite as one people to continue working on LKY's unfinished business for us. He is gone but he left us this beautiful place to build on for the generations. I wonder what other ominous thoughts LKY had which we need to discover for ourselves. We have to earn the right to know? No use if we are frightened. We must rise and say the only thing to fear is fear itself. Borrowing from the great man LKY, I try to be unsentimental about losing him. I thank him very much for making a gradual exit because that is the most selfless thing he could do for us. Toward the end he was clearly passed his peak and some of his ideas were near their best used by date. We must separate the man from his insights which would be a low precision compass and map for the way forward. Looking around, reading how he had impacted so many leaders, I am amazed the world is not an even better place than we are finding it today. Clearly many sought his advice but are poor users of his wisdom. I find Robert Kuok's response to LKY the most practical and useful. 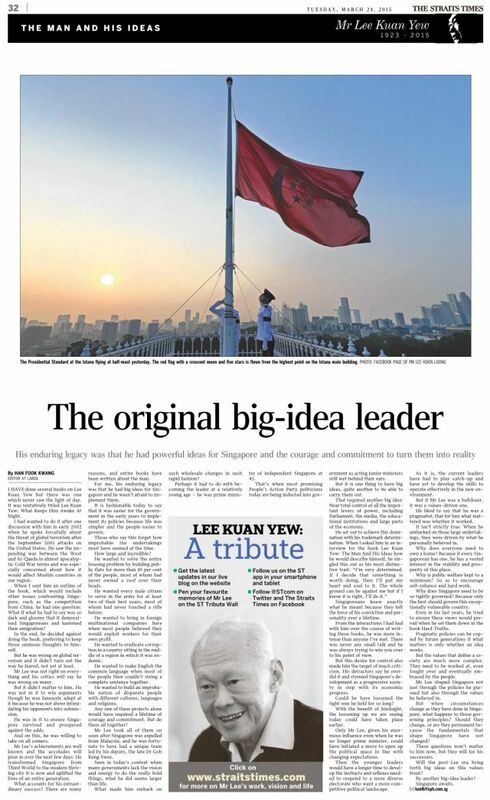 Using his own SCMP he had this published about LKY. Kerry Group controlling shareholder, Robert Kuok, a life-long friend of Lee, paid tribute to “a giant of a man’’. “All of us who have known him, feel greatly distressed and saddened by his passing,’’ said Kuok, who was a schoolmate of Lee at Singapore’s Raffles College. “Lee Kuan Yew was a giant of a man. His mind, sharp as a fine blade, was focused on pursuing his wish of establishing a just, fair and decent society. And no-one, whether friend or foe, can deny that he achieved this. ST Li Xueying also gave us a good piece on the relationship and differing views between these two old schoolmates. The article and many others we will come across must be adapted to be usable. Robert Kuok's differing views bring balance to the extremes in LKY. For me I prefer to borrow historical figures larger than LKY to draw lessons for us. These past high impact personalities and their work combined with what LKY had thought and done for us is one of the best ways to benefit from all of them. In this arrangement LKY is the conduit and no longer become the focus by which we can benefit from the accumulation of global wisdom across time. Many people here and I had also indulge in this myself, often analyzing LKY policies before and after his Old Guard ministers retire from Cabinet. How men like GKS, Raja and Dr. Toh brought balance to LKY's extreme views. I wished his son LHL was also able to act in that capacity, but I thank him for trying his best. The above from Li Xueying's article. I thought that read like some of the academic high scoring obnoxious scholars we have all come to hate. But the pragmatist in him let in nice fellows like Hon Sui Sen eh? LKY is a complex character and you can study him up to PhD and beyond. I can only write at most 1% what is on my mind about him. 70% of my thoughts about him are contradictory and clashing. There is no profitable way to learn from the man unless you are first clear about what you want. Now if you want something else another time, you can come back and pick up something different. That's the richness of the man. That is also why two quite opposed powers the US and China they could go to him and pick up what they want, but in the end LKY used both of them to get what Singapore wants. When we lose LKY, we lose the ability to influence major powers to create the environment for our security and prosperity. 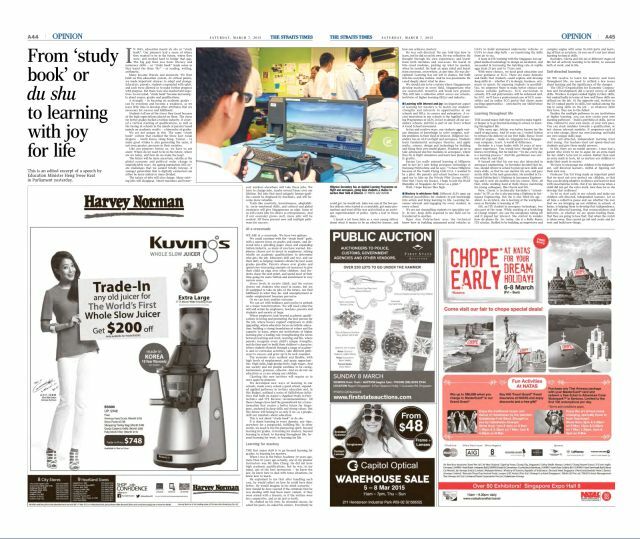 In the days ahead people will be studying LKY with earnest interest but I am afraid many of those studies are time wasters. Some will be looking for stuff to fill men and women magazines even, e.g., like how to love your wife. Others would be so impossibly ambitious as try to deconstruct the man completely. As for me, I will benefit from the rich trove he had left behind for us to consult wherever I have a clear question peculiar to Singapore that I want answers for. Yes, I would also often use him as a conduit for greater and time tested wisdom from the Greats before him. How to make insight elsewhere workable in our context. Finally an important point from Robert Kuok. That mistake I fear could cost us more than we imagine. I just have to update my post with this one by Viswa Sadasivan: All His Adult Life....Singapore. You ask me, I think Mr. Sadasivan should be the ST editor than Warren Fernandez. He it not too old to do the job, a more than worthy successor to Han Fook Kwang. My original post has 1% and only happy to make it to 2% with Mr. Sadasivan article. It also brings some balance to my 1%, which I feel it sorely lacked and kept me unhappy for the last few hours. I just came from explaining to my daughter that LKY possess humility, but it is too time consuming to explain here. I rounded up the discussion explaining that people are queuing over night to see him the last time because even if they can't say it well enough they could feel he had always cared about this place and its people more than himself. 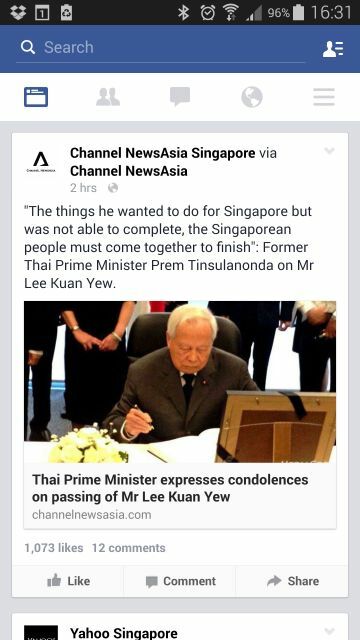 That is the meaning of selfless in LKY life. 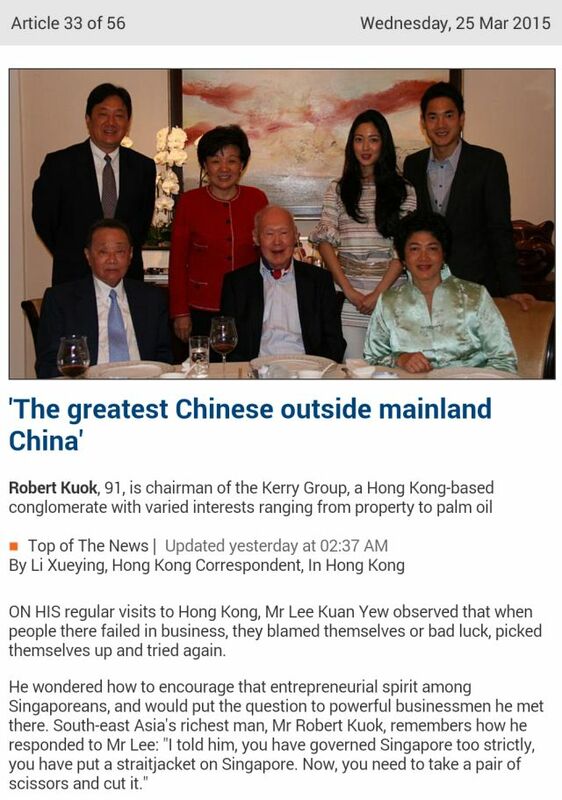 As for Robert Kuok, he is a smart businessman who sees LKY more clearly than most. LKY was never interested to compete and be richer than him or Li Ka Shing. Yep, unlike LKY, Kuok is not a selfless man. For me, he was useful to bring out another dimension of the very complex and multi-dimensional LKY. First thing my kids remarked when they saw this red box was, they have something like this for PM Hacker in, "Yes, Prime Minister". I told them we inherited our system from the British. If it was helpful we keep it, no need reinvent the wheel. 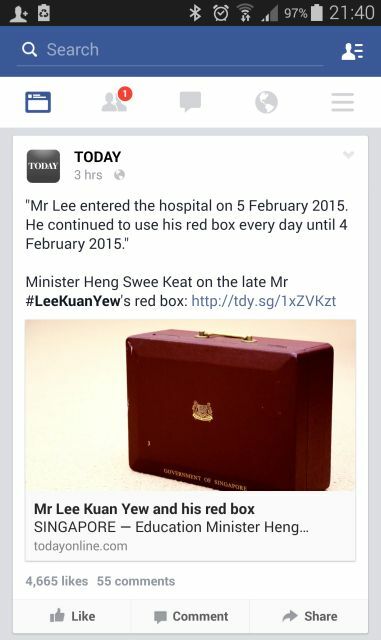 Heng Swee Keat story of this red box was an interesting read. Coming after reading too much about LKY that it is starting to weary me, my thoughts are straying to other matters. I was surprised where they were leading me. This man was as obsessed as Paul of Tarsus. Now Paul lived and died nearly two thousand years ago. It is hard to piece together his passion and hard work. Myths surrounding the man also made it doubly hard to understand him, but as lots of information about LKY begun to appear, I thought I was beginning to understand Paul better. Paul was obsessed with his relationship with Jesus whom he never met in this life. So he directed his passion toward what is closest to his new Lord: the community of believers which became the Church. Few Christians treasure and invest themselves to know their Lord. They usually jumped into it in many lazy ways to many to enumerate. So they don't get rewarded. My children told me how Newton obsessed himself with natural philosophy and was amply rewarded. Darwin obsessed over nature and so figured out the process of natural selection. Occasionally we have seen Paul again in the likes some Christian saints down the centuries and closest to our times Mother Teresa. Yet none was as manifold as the original Paul. If we can't have Paul, any that approximates him is good enough. Ditto LKY. Where to find the next LKY? He or she is someone as obsessed with Singapore at the original was. We can only look for him or her, more likely he or she will surface without our looking. Don't bother looking at anyone in our present parliament. Just like the Dalai Lama, the successor do not make its entrance until the incumbent has left. Were Christians as obsessed with their Lord as Lee Kuan Yew was with Singapore, but Christians love to look in all the wrong places, and act as they please. What relationship? what way of the Cross? Jesus is best as Santa Claus or counselor and problem solver. It is always about them and not their Lord. What if we do not have another LKY? We will have to make do wishfully trading one giant CPU for many smaller in a massively parallel processing configuration. The magic sauce is the software that connect these processors. Perhaps that is the way to go. We have to build that software. LKY tried but doesn't look like he succeeded. At least I think he bought us time. Like Paul, the man was selfless. Paul was often misunderstood and the same fate befalls LKY. I don't understand him either. On the other hand now that he is gone, I can see him as long as I am in Singapore looking out of any window. We will never understand him and in time he will be mythologized. He expected scholars to study him and I sincerely hope they do as the Americans are still studying their founding fathers. This is the front page of what Xinhua has put up to honor the life and work of our late founding PM. And here is the tribute to Lee Kuan Yew by President Obama, Joe Biden & Jill etc from the US side. To save time, I just exchanged messages with my siblings on this topic. The transcript. 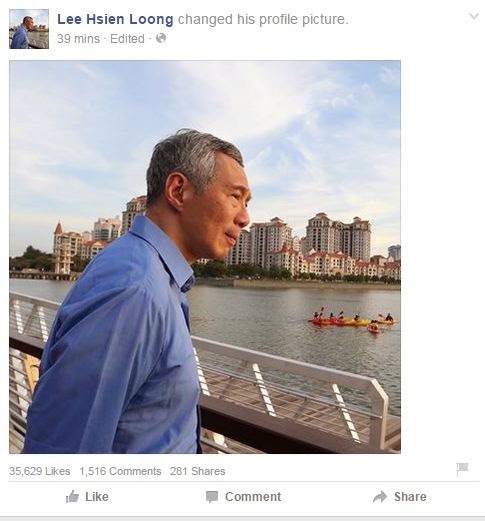 Despite being hounded and bullied by the PAP, Low must still show magnanimity. Political high office aren't for ordinary men and women. He is not extraordinary enough. This guy will serve his interests, focus on his pet projects than putting the people first if he ever becomes our leader. 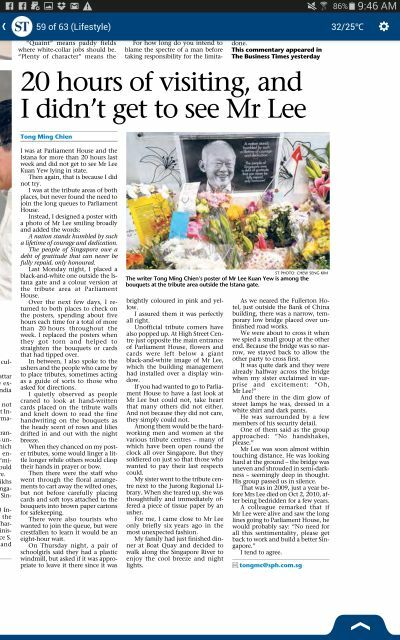 Low could have written like he had perhaps for another of our PMs when the time comes, but LKY was special and it is revealing of the man's character and attitude that he publicly failed to recognize that. In many ways LKY transcended politics even if he operated from the political arena. Like it or not, he is part of our social and political DNA. To me any leader who fails to recognize that disqualifies himself or herself. Can you imagine any US President pouring scorn on George Washington, Thomas Jefferson and even later Abraham Lincoln? Even the Chinese kept Mao for all his terrible mistakes. For all the Great Helmsman faults, China would still be mired in darkness without him. 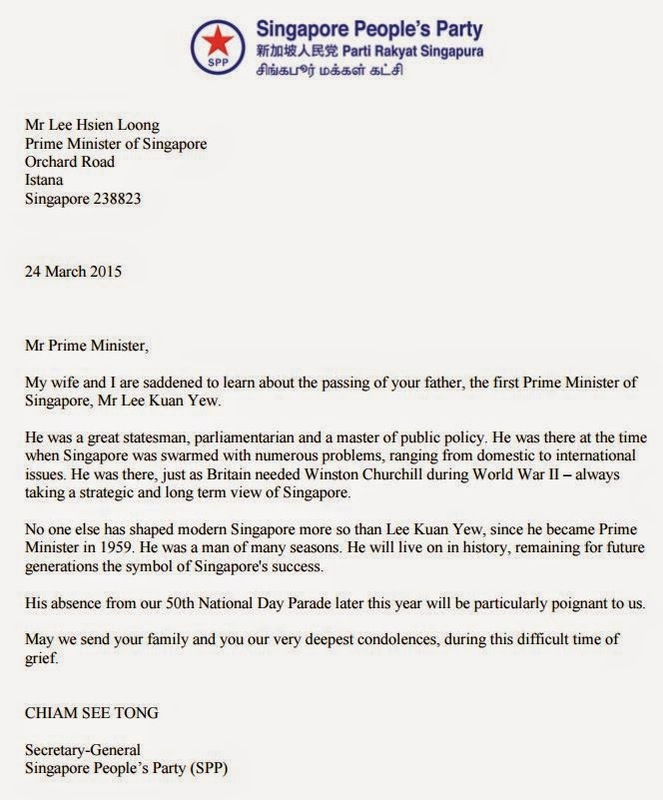 Compare Chiam See Tong's condolence letter to Low Thia Khiang's. Kudos to Chiam, ever the gentleman and patriot. He likens LKY to Singapore's Churchill, which is the view held by Nixon of Lee as far back as the 70s. Mr. Low, eat this! New Zealand's parliament pays tribute to Lee Kuan Yew. And who are those ignorant people who left some comments for me like they were from another planet? Eat this too. 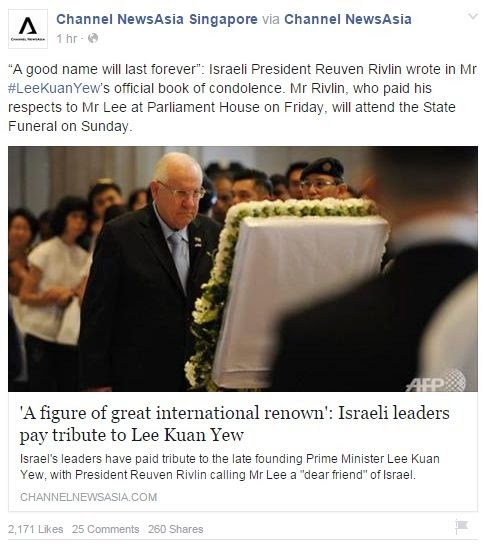 You can naturally expect like the Kiwis, the Aussies to also pay tribute to LKY. The secretary in his own words. I go to bed each night wondering if I will wake up in the morning to learn that Lee Kuan Yew has left us. 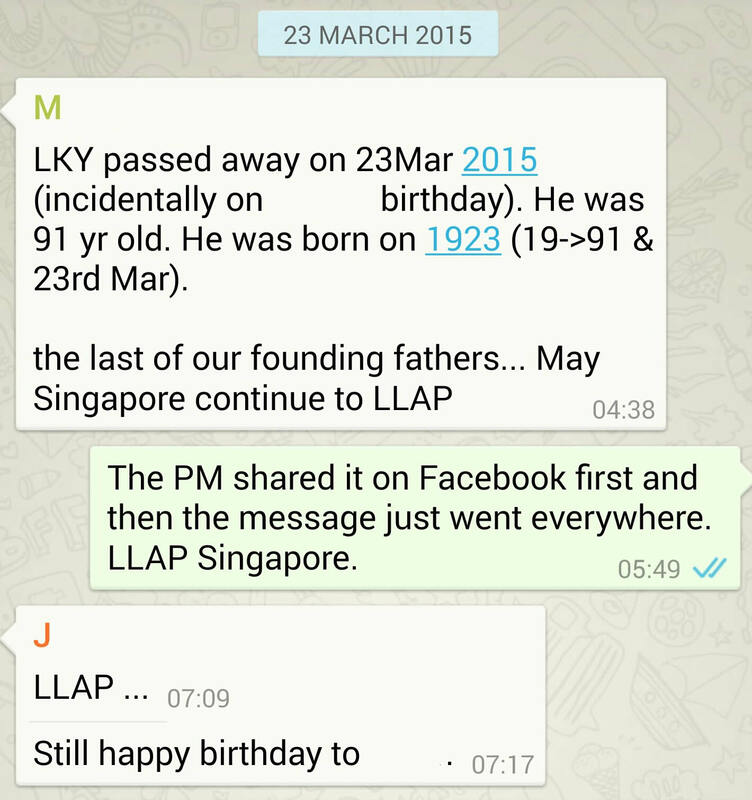 This morning I woke up to receive a message from my brother that LKY has passed away. LLAP: Live Long and Prosper. We are all trekkers. Now Lee Kuan Yew belongs to the stars together with those who had gone and once served with him before. It is now up to us to do the same for the next generation as he had once for my parents and us. I woke my daughter this morning for school and the first thing I told her was Lee Kuan Yew is gone. I am not expecting very much from her but wonder how and what we must preserve for them in order that we finally reach the stars. My thoughts wander to how the Americans had mythologize their founding fathers and when the myths are established and matured, they then add on the human frailties. I think we can borrow from them. The Chinese had done the same but long ago and what they had to do was to turn their heroic leaders into gods. This is an excerpt from Obama's surprisingly long tribute to Lee Kuan Yew. Shows how much he admired him. It also gave me the opportunity to reinforce my point to too many clueless people the irreplaceable role LKY served in the security and prosperity of Singapore. This was a role his successors never took over from. Well nobody could but now we badly need someone who can. For this missing bit I am afraid for Singapore. But I can hear him say to us, "make the effort!" We were way too early for IT Show this morning. We arrived at 10.30am thinking that it begins at 11am. Parking was incredibly easy to get and I was wondering if I was missing an important hint. We had early lunch at Ding Tai Fung to redeem our mistake. This year's show looks like a great success. They have brought back the magic. We bought a Sony camera, two Transcend 64GB micro SD cards and a new phone case for wifey. Before we left I visited Creative booth. I kinda feel sad about this special homegrown company. I really want it to be successful again. 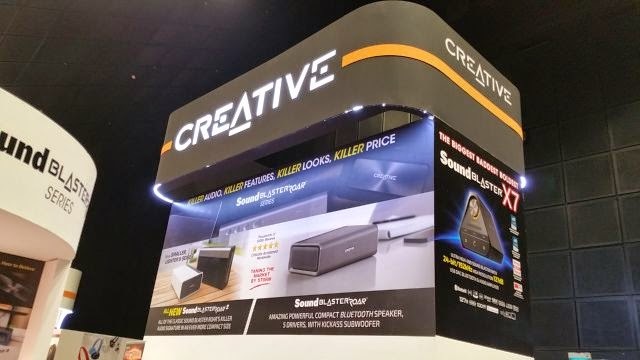 It was gratifying to see customers forming a line to pay for Creative's products but I know they will have to do a lot better. Bought this Sony camera at IT Show today as a birthday present for the daughter. I have not given her a birthday present for the last few years because both girls get gifts from us all the time. It just so happened that her birthday is around the corner and she would really like a camera like this for her impromptu nature shots. She had been telling me how often she spots them in school. Naturally she will be bringing this with her to campus everyday. 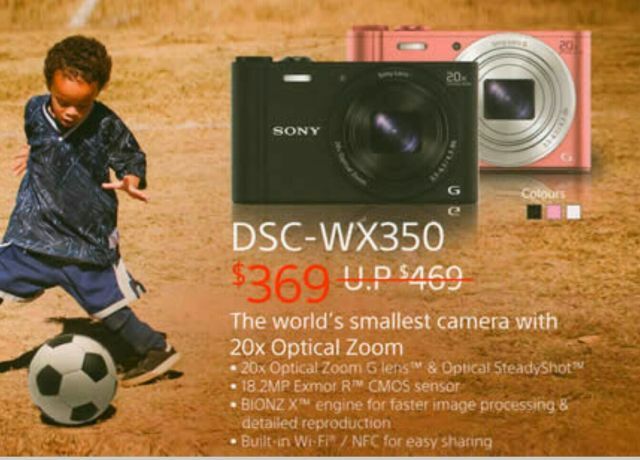 Ths Sony is small, light weight and powerful fits the bill very well. We still remember and make Kodak moments. Yes, for all your significant moments. This guy has a huge appetite, the confidence and long term thinking to give us a lot of trouble. Good luck to those of you who take his bait. Given their profligacy, it is a matter of time he run into some financial spot. Sure our own billionaire Peter Lim has also gone into business with him, but when Mr. Lim is out many clueless Singaporeans would still be in for some royal roasting. Whenever he runs out of money or simply want more, he will change the rules on you. Lest people forget, he was the one who had a brush with law over some firearm issue. He got away as he is royalty. If the federal government is too loose with him, his security detail will grow into a private security force. This guy must be kept in check but he is going to get fabulously rich. He will be a problem to us if we ever show any weakness. I hope our ministers are up to dealing with him. 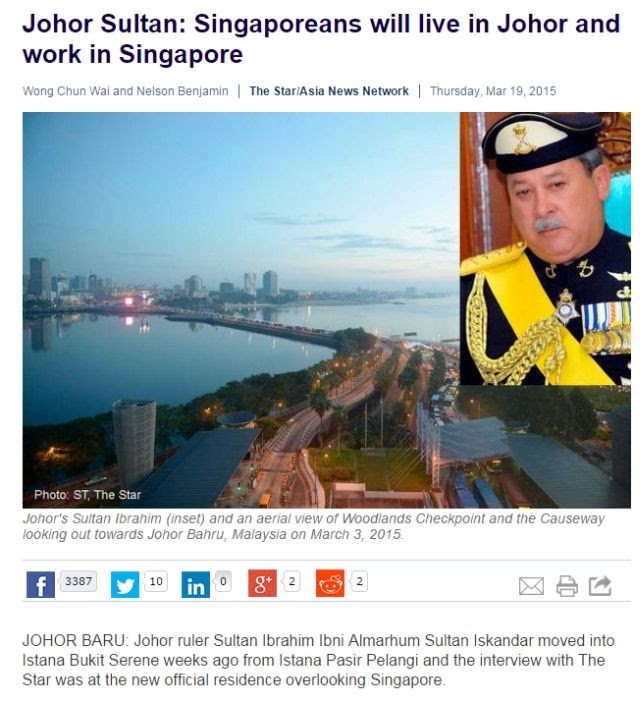 I bet to him, Singapore ought to be part of Johor because that is in the history books. Behind his smiles and hospitality are daggers. We must never give him the chance to show them. Meanwhile we try to make it profitable for them and us but never forget how quickly things can go wrong. Related: Johor land reclamation: Geopolitically signifcant. Bought this at Courts for $548 to replace the short lived LG one today. Also comes with a smart TV box which we might not bother to go claim. 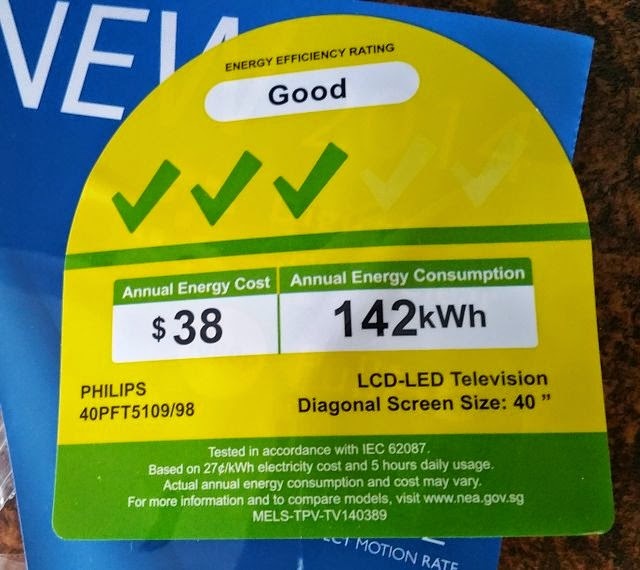 Our LG was a smart TV too which we have to be reminded was "smart". We cash and carry this TV home and in a matter of hours have a new TV to use. It was fun. Unlike the equivalent pasted on the fridge door, it is not practical to have this stuck to the TV. Did it say 5 hours of daily usage. For us is more like 5 hours of weekly usage. I think we replaced the TV because we have always had one and the brief moments of watching something together can be quite special. Also when the school holidays come around, the children watch quite a bit of old DVDs. Would this be our last TV? I haven't thought of this until I was about to complete this post. On the last day of CNY I waited for news that LKY was well enough to be discharged. I assumed that was the prayers and wishes of many. By the next day, I learned it didn't happen. I wanted to update my blog post with that but was simply not in the mood. News that his condition has not turned for the better was all over social media yesterday. I also received the same on my Whatsapp account. Publicly VIPs and members of the public wish him a speedy recovery. Privately I imagined the thoughts might be much darker. I think he has been on the ventilator for too long, not that he can helped it. Even if there were no pathogens, the immune system could respond to the machine as a foreign object and inflame the lungs. I shall not continue to discuss this as I am not a doctor. Many doctors cannot even speak on this authoritatively. I have met too many of them and saved family members too many times from their idiocy. 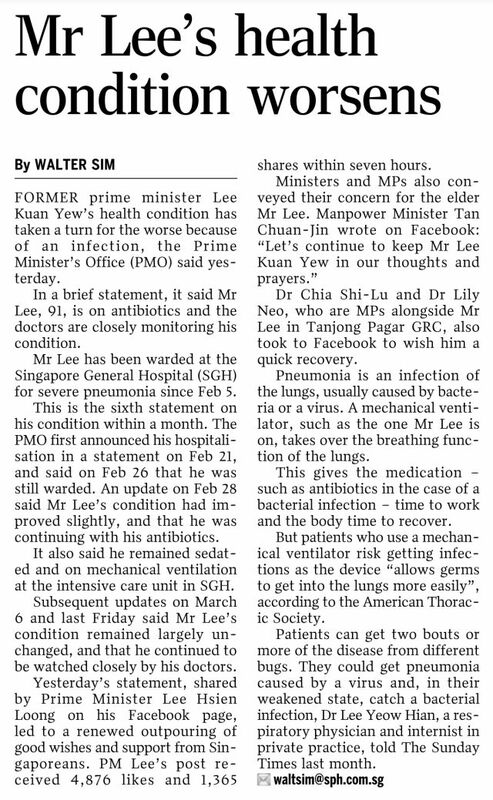 Doctoring mistakes are far more common that the public perceive, but LKY is getting the best care we could afford. Most people would not begrudge him and his family that; Khaw Boon Wan maybe. At the emotional level Mr. Lee looks like on the familiar path those of us who have experienced caring for the aged sick many time recognize. I have been through this three times. The scenery is the same and the last time at SGH ICU too. Against the lessons of experience, I have signed up for a happy surprise but you know deeper down you are not that hopeful. I would be most happy to be wrong. Let's hope he can present for August 9, 2015 even if he had to join us from home using a TV. I was at the airport waiting receive wifey from her trip when I saw this on my phone. The picture says it all. Now it is all about keeping the vigil, waiting for the inevitable. 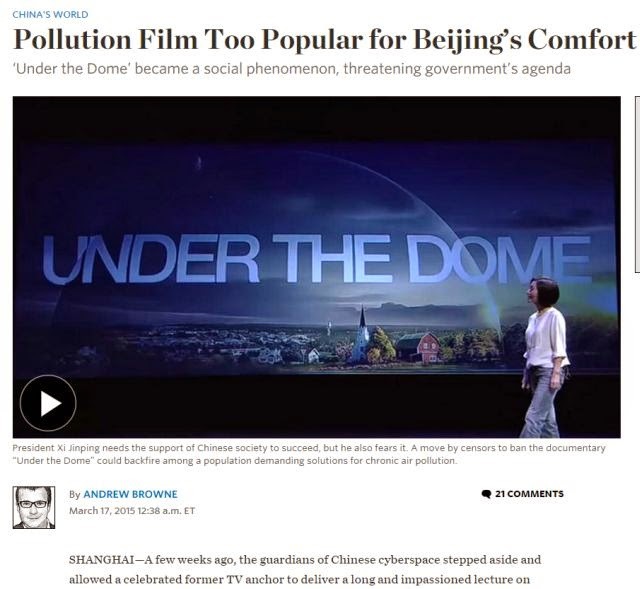 China used to only have happy problems which they were only too glad to solve. Now they have mostly unhappy ones. Happy or unhappy problems the list is too long to enumerate. The most frightening problems are those that affect everyone. Jobs, housing, healthcare and security will always rank very high but pollution was taken for granted. They keep ignoring this problem and I think they are now very near the limits of public tolerance. I have time for only the first third of this documentary and fast forward the rest stopping at strategic points; really appreciate the producers for sticking to plain Chinese avoiding too many idioms. If you put one and one together, Li Keqiang publicly showing less confidence from getting local government to cooperate to implement reforms looks worrying. Most problems cannot be solved without their cooperation and rapidly solved unless they are highly motivated. They were once extremely motivated to stoke growth. It made them very rich. Now who would cooperate if it makes them poor? As outsiders we do not offer the Chinese solutions to their problems. You only have to decide if they can overcome them. They have always made us nervous or in awe. Which way would it be this time? I just saw this from the email I just received from Singapore Power. Makes no sense to me. The only reason why we are so "Efficient" is because we do almost no cooking on week days. On the other hand we are very credibly conserving water and electricity coming in below or near average for both. The beautiful "Efficient" green line I think is impractical and purely aspirational. 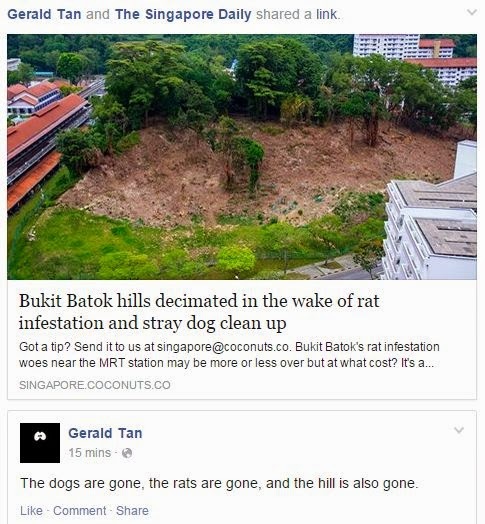 Bukit Batok Rats: Take out the roots too. This gives new meaning to getting to the root of the problem: no more roots! This is smacks of people in charge who are not on top of their jobs from lack of knowledge. So they over reacted. No problem, our climate will produce a new and beautiful green cover in no time. The perception that irresponsible feeding of stray dogs was the cause will harden into fact but I am agnostic. The explanation was too quick and convenient. So the truth is still out there. Only that I believe less and less what the government tells me. Can't be helped. It is often better to just simply admit you don't know even if you are not going to find out. We don't care much for SG50 celebrations but we really like this sort of clips CNA put out. In fact CNA is the only local channel that we watch now. Sunday night program on our wild life hosted by Sir David Attenborough was a winner for us, and many more we had caught and downloaded. All things Singapore and Singaporean. We are celebrating SG50 unconsciously. The Americans started it, the Europeans copied them. When is it going to be our turn? Every regulator should be doing this, has been doing this if you are worth your salt but keeping private about it. As and when investors need to publicly know the results of these tests, it cannot remain private. Before such tests were private, they were transparent between regulator and banks. Now that they are public, they have become opaque. Irony! But I agree with David Reilly that it should be. As of now the mindset of our big local banks, the post crisis environment make this inappropriate. We recognize that we ought to take more risks but the experience of the last decade or two show that we do not know how. I hope we are learning from those mistakes. In the Great Financial Crisis, we were so confident and rightly so that we didn't feel the need to guarantee our bank deposits. But the people don't know, so when Hong Kong declared that deposits will be guaranteed we had to do the same. Many lessons from that episode. But I also have no clear enough idea how financially conservative we really are. 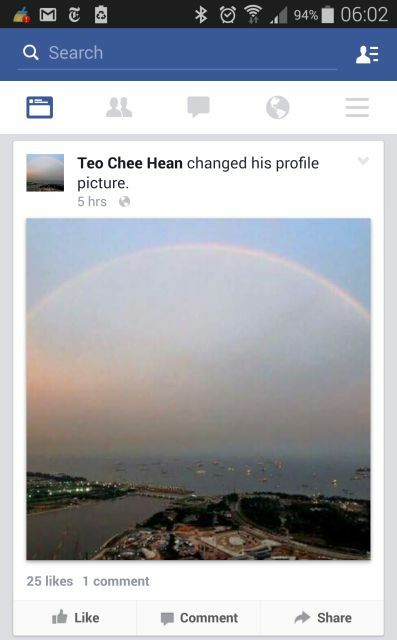 Perhaps our President also only have a hazy idea if you go by the late Ong Teng Cheong's experience. Financial conservatism has its great merits but if it is achieved with much pain to the people, could it be even more excessive than Chin Shihuang inflicted on the Chinese building the Great Wall? Just because this is more psychological than physical, it is less clear. Just because most other countries we compare with are so corrupt and wasteful, we do not have realistic comparisons. All virtues taken to the extreme turn into vice. May be our banks can do very much better but we do not know how. Neither do any FTs we hire to run them because they bring all the bad habits from elsewhere. I think we have to invent our own solutions. What I am beginning to realize is if the government turn corrupt, we are so rich that they can steal much wealth without us noticing for a very long time. According to Gmail, this article arrived in my in in box five hours ago. It was a fascinating read and here was my reply to the sender. In a way this is a positive development and it is heartening to see so many smart people not waiting, but taking the initiative to do something about their future after seeing the writing on the wall. On the other hand FinTech is obviously becoming a crowd in a hurry and more than the usual number of start ups will fail. 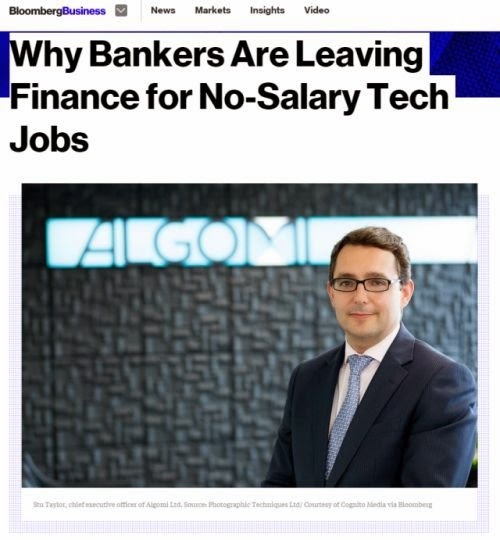 They are also part of the tech bubble which can burst any time. This will be be added misery were it to happen months or even a couple of years from now. Nevertheless anyone who can differentiate themselves from the crowd should try. For such types there are no good or bad times. Yet as usual too many people cannot help but thought too highly of themselves as the behavioral economists have in the experiments shown us. Finance is definitely on the cusp of being transformed. 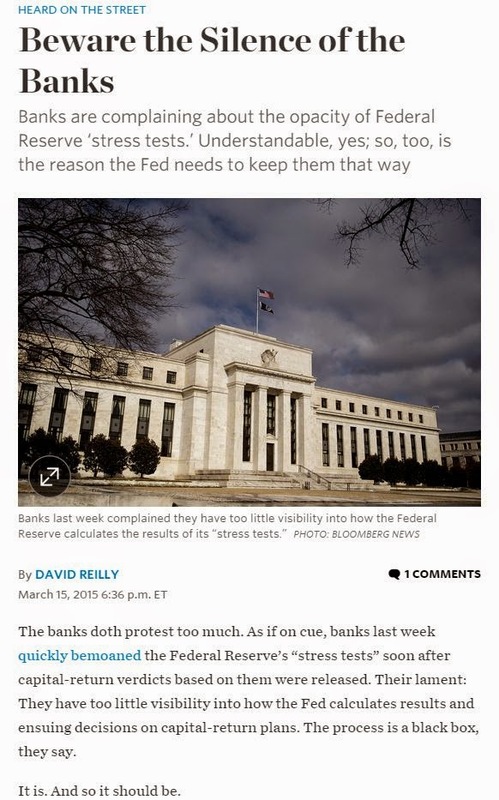 The Fed first and later the ECB go about stress testing banks. After a few years of testing, bankers are going to tire and think of workarounds. They will figure something out even if they don't use the lobby option given their rotten reputation. Then we will have a shadow finance sector by another name that is massively enabled by FinTech. As this develop elsewhere what happens to our stodgy banking scene? Others had almost gotten killed and going through rebirth. We are at risk of becoming irrelevant from playing it safe. But we weren't savvy enough to risk well either. What a conundrum. Unlike in the past when regulators possess an iron grip over financial institutions, this is no longer possible. Regulators have to learn to co-opt the market. Boring central banking is one of the hardest jobs now. Behind the calm and sometimes expressionless demeanor things are going to get exciting. MAS cannot have the attitude that only a few people at the top need to think and the rest just obey. It might now appear so yet, but change is coming in a hurry because in this business you move bits and not bricks. It is frictionless. Bought in January 2012; discovered that it no longer works tonight. Time to get another one. I would have expected it to last longer. None of our LED and LCD displays from our old PCs have ever stopped working. Some are really old but none are LGs. No more LG TVs for us. Sure, we just might be unlucky but there are so many makes to choose from. Since we hardly turn on the TV there is no hurry to replace it. If we really need to view a program we could always plug the Draco to any of our LED displays or the TV in the master bedroom. Were it that the PAP is as white as snow, such that it has earned the right to judge, then it could measure others against themselves and let the results speak for themselves. If you aren't that white then you only help others see how imperfect you are magnified many times. What for? Politics here is heading down the path of cynicism. More and more voters will lose respect for politicians. The people cannot be rallied. Hard but right decisions can no longer be taken because trust is lost. You have to be living on another planet not to notice that trust is already eroding. Even the office of President is less well regarded today. Voting is compulsory here. If it wasn't I bet voter turnout would decline mirroring elsewhere. We are becoming another also run, which we know must mean the death knell for us. So what if at the end of the day the PAP won? It can only be a Pyrrhic victory. Voters will make your life very difficult for the next term. Even internally the civil service leadership would lose respect for you even as rank and file civil servants find it more testy to serve customers. As we become more cynical, the only guys who would find that it make sense to serve must be the viler ones too. Big time corruption is next. In fact there is too much to steal that theft can be hidden for a long time. A window exists for us to reverse the trend. It is still open but for how long? 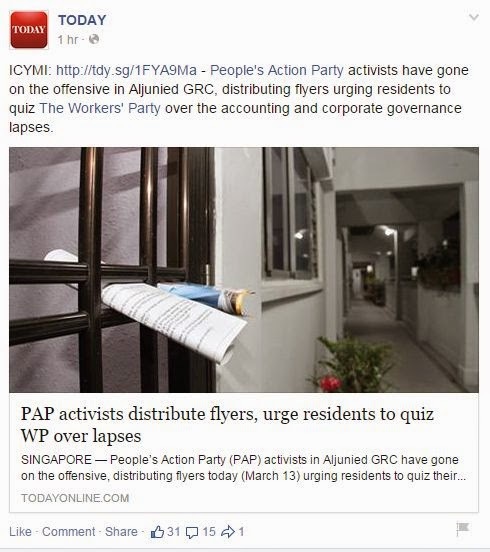 I wish the PAP would fight more honorably. Their MPs would do their homework. Ministers should be honest with how they use facts and statistics. But they never take responsibility any more. If something don't work they scold us but this option is quickly disappearing. Now we will make them regret that if they try. How they have fallen from their high perch like the emperor without clothes reasoned that they must be wearing invisible and much more beautiful ones! I had actually wanted to record my view on this issue here yesterday but was so upset with MP Liang Eng Hwa I decided to wait. What a bully. If MPs can bring a silencing mallet to the discussion what about ministers? Well more people respond to ministers and our numbers must often have caused them to think twice. 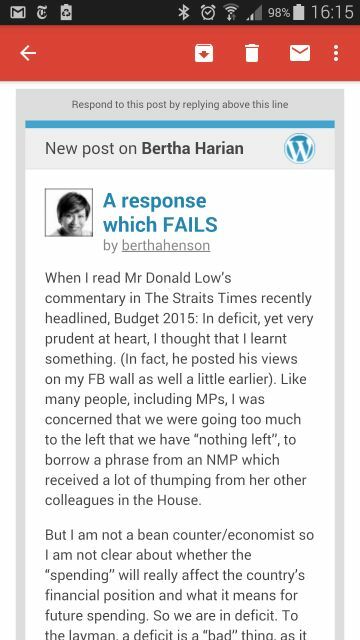 I agree mostly with Bertha Henson's blog post. Methinks Mr Liang also needs an education in the role of editors. Yes, they turn “rants’’ into something publishable – that’s their job. And that’s because they see something in the “rant’’ worth sharing, a germ of an idea, an argument. They try to draw it out. In fact, it was very nice of Mr Low to thank the journalist because most editors don’t get thanks for working on someone’s article. This sort of responses from politicians will only drive views underground. There are people (like me and probably plenty of others) who really want to LEARN something and appreciate different perspectives. How is this kind of response (so 1980s...) good for Singapore? * Now I am worried that someone will look at my primary school essays, my diary and my FB wall, of course, to make the case that I am not sincere. So often our MPs show themselves to be poorly informed, prejudiced....actually only one word needed: clueless. Even Teo Chee Hean thought nurses are low skilled jobs but NUS offers a degree in Nursing. Of course I can't forget how Shanmugam failed to catch the anomaly that MA charges for residential and commercial units cannot be the same. Where I disagree with Ms Henson is that the responses from politicians will not drive views underground but make people angrier. You keep doing this, there will be no more discussion online or in public forums. At some point you would be shouted down. If the "offender" is escorted out by security officers, others will take his/her place to shout you down. Then a few will stand and shout you down simultaneously. You tell me how to run the country like that? What would foreign diplomats and investors think? Look at what just happened to Lui Tuck Yew. What did he say wrong? Nothing except that he was insensitive and seen to be out of touch. LTY advised us to shop on Sundays instead. He completely missed the plot. 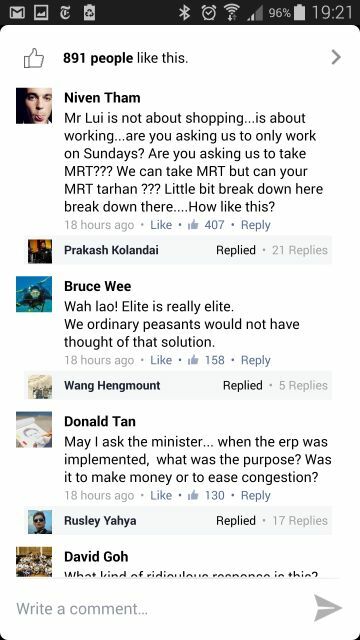 I don't remember people showed so much unhappiness toward Mah Bow Tan, Wong Kan Seng and especially Raymond Lim. 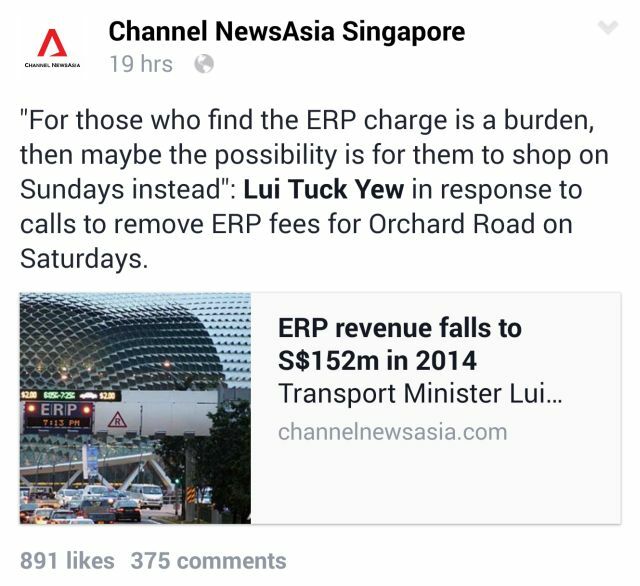 Raymond Lim and his predecessor was more responsible for the state of land transport than Lui Tuck Yew ever was. Minister Lui hasn't even started talking like MP Liang yet. You MPs and ministers should just be more transparent, accountable and decent. Don't be bullies. That is the ultimate proof that you are cowards. I had been gentler to say you all lack political courage. You have gotten too used to staying safe and bullying everyone else. No need to exercise much courage especially when heads you win and tails we lose. Didn't realize that most of the courage had evaporated. Now when you need it, you realized you don't have it. Why don't you MPs simply admit you have not done your homework and understand the budget? I think Tin Pei Ling having gone through the baptism of fire is better than most of you. If MPs and ministers are so unhappy with their pay and work conditions they should just go do something else. Politics is a calling not a career never mind it has been paying you like one for more than twenty years. Don't compare yourselves with the hidden perks politicians elsewhere get unless you want to be corrupt hypocrites like them. Poorly paid Chinese top leaders are multibillionaires. You can be a billionaire too by selling paint. Sounds so easy, why be a politician? So challenging and thankless. Those who did not pass the patriotism test should never be allowed to serve as MPs. Who is that MP who didn't serve NS before? That's OK as there are other tests of patriotism. Did he pass any? After reading the article from CNA, to put it simply, SMRT and LTA basically don't know the train systems they are in charge of very well. Another way of saying this is they don't know their jobs. We are paying people to run something they don't understand well enough to keep it reliable and is constantly surprised by how the systems act up. We are paying them money to learn slowly. It also hint of lots of staff are badly trained as well. What the hell are we doing keeping these people around for? Learning on the job at our huge expense. By now nobody wants to understand why. You had many chances long ago and blew them all. Just get it to work or get out. But the LG has no sense of shame. A military man without sense of shame is also one without courage. Why on earth did he even take this job in the first place? To put it bluntly, the minister is talking nonsense. A comment at the top put it well. Vivus Loh Just like how we should stay healthy to avoid going/staying at hospitals right? Brilliant. I shouldn't be blogging right now. I ought to be look at interest rates options this very moment for my work. But this has to go out. I can take apart his story as reported in the ST in many ways but I would just choose what I consider the most important which will take down his house of cards. TCJ case makes no sense. This is completely surreal. The subject is highly complex and uncertain and he reduces it to bite size but lost all of its essence. In short, his example is too far removed from real life to be useful. Not even good enough for a computer simulation game! For simplicity the minister assumes the poly grad pay remain static. For the case to work everyone's pay must also remain static. In fact, all things mustn't change too much which we know is impossible. Life is full of surprises. The first part which the poly grad pay held static looks "reasonable" and helpfully conservative to build a robust case, but what about everyone's pay also do not move in order to make it realistic as we must have a relatively stable environment? What sort of world is that? What will happen to consumer prices? Every year this hypothetical poly grad will see his standard of living fall. Who will accept that? Over a lifetime interest rates always look volatile. The assumptions for compounding makes no sense except taken at extremely low rates. Yes, the math he says is simple but it is the wrong numbers. 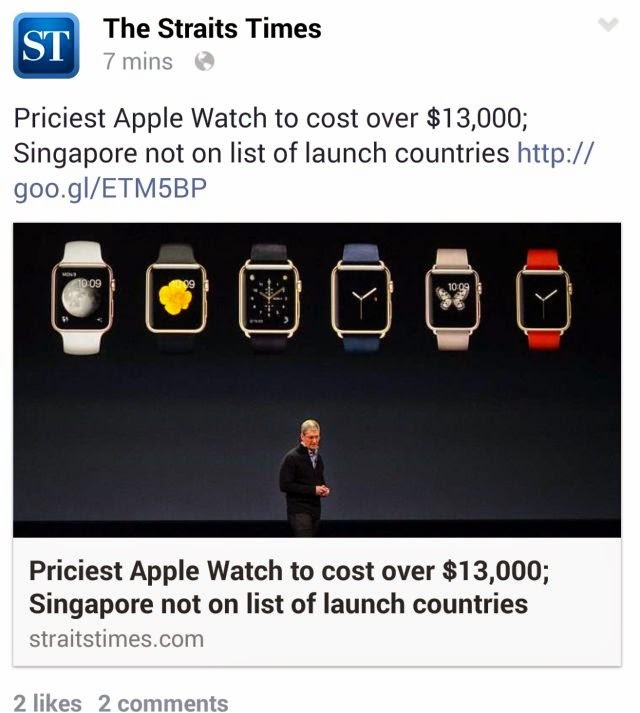 All the time he conveniently forgets that Singapore is the ultimate price taker. That is short hand for we don't what tomorrow is like because we don't even know what prices we have to pay. Yes, we also need to pay for healthcare as Vivus Loh pointed out. As the country must remain relevant and useful to others ALL THE TIME to survive, so must its people. Aim to retire but be prepared that it may not be possible. We are better off rejecting the minister's bad advice. If we take him up on that, one day this will be an impossible nightmare task a future minister cannot deliver on. Talk about thinking log term eh. He is trying to make his job doable by kicking the can down the road for his successor to deal with. Twenty years ago, a minister offering such advice would be welcome. But a new generation of more thoughtful people have grown up but our leaders have not kept pace with the new savvy out there. Try harder minister. Don't insult us with kindergarten stories. I was at the car distributor waiting for the blown headlamp to be replaced when I came across this. So the PM also weighed in. 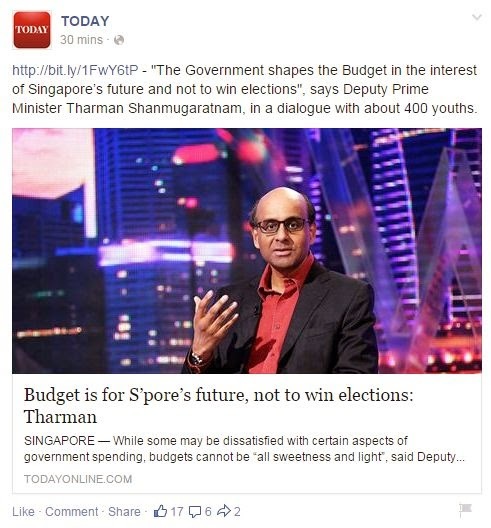 Fortunately it isn't Tharman, whom I think is a really good guy. Just because Buffett and Einstein made some wise statements about the magic of compounding people must do their homework to know how to use this concept properly. In real life compounding is not magic but sheer hard work and often with some luck. To you it is magic because you get rewarded for giving your money to be invested. Meanwhile someone is working his butts off with your money to make it happen. Perhaps take some horrible risks as well. In recent years, pay him less but yourself more in order to fulfill your high returns promise....many ways. How precisely, there isn't enough transparency to tell. Were it a business, 5% compounded into the future indefinitely and guaranteed is a herculean task to achieve. China's GDP has been compounding above 7%, often more for many years. 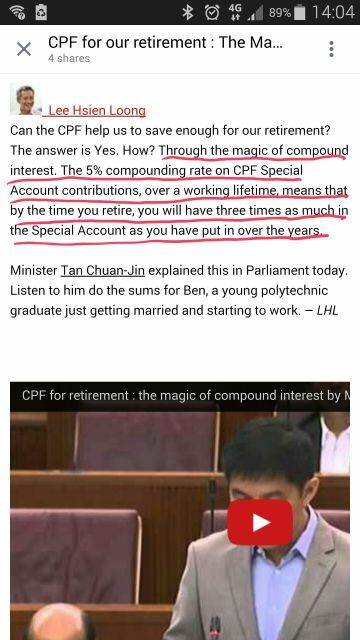 That is a good example of the magic of compounding without taking away the very hard work to make that happen. So what is the PM trying to say? It is easier to say this indirectly and rhetorically. Remember there is no free lunch. Remember you must always know who the sucker is. If you don't then perhaps check if it might be you! MPs clueless about how the budget is constructed should also ask if they are suckers. Governing is hard and we must not make the job harder for our leaders. On the other hand we cannot allow them to make it easier for themselves at our huge expense. Remember until 2011 they used to play heads they win, tails we lose. That is why they are always scolding us. To me they have lost the right to scold. Elsewhere if a politician scold he should prepare himself to look for another job. Scolding is their egregious way to transfer blame to us when we all share responsibilities and outcomes. Trust but verify. Whatever you are ignorant of, the government would not hesitate to take advantage of that. They can forget about the old bond of trust. That is over. Don't tell me stories about compound interest. I am in the game, I know what this creature is. More important I am not alone and our numbers can only grow. Add another minister, this time Shamugam to the pile. This one cannot judge numbers. He cannot tell that the MA charges in TCs for residential units must be different and lower than commercial units. These calculations are fantasy numbers done in the same way by financial planners to sell their fat margin plans. A senior counsel ought to know and do better! I suppose TCJ just got them done by his underlings at CPF in the same style for him to use with us. Purportedly easier for us to understand. 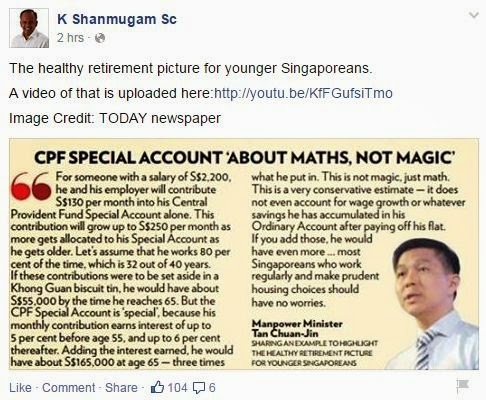 And like Shan didn't check like the numbers he got from the MND for the MAs. This sloppy minister just pass it on and even talk like he knows. These ministers are basically good people but sometimes I can't understand why they act so badly or pretending to be stupid. Or are they actually out of depth? Need Tharman to come rescue them? But the PM was himself a FinMin before and presently the chairman of GIC. Wifey has been waiting for months for this watch. I made a note that they were launching this and first thing in the morning at 5 am was what I looked for. What a downer. Does Apple think its customers are suckers? True enough in the next few hours I read nothing good about this ripoff. You spot anyone wearing an Apple Watch, that is the label for new stupid. At this price point even those who wants it would be embarrassed to wear one publicly. High society never wear something which the hoi polloi will lampoon them over. There will be a spot the idiots contest on social media. A non negotiable feature of a luxury product is durability but this a transient tech gadget. Patek Philippe got it perfectly right: You never actually own a PP, you merely look after it for the next generation. Therefore Apple fails the test. I wait for the Android community especially Swatch to show the way to Apple. Finally they opened this gift from a few years ago and try to grow it successfully. It must be easy because they have become popular and you can buy them more easily than ever. They have lots of them at the Botanic Gardens and Gardens by the Bay shops. 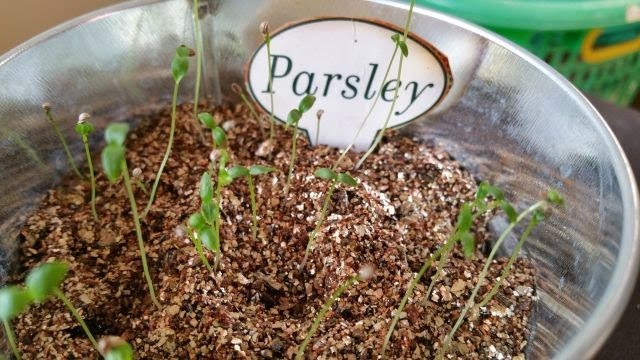 I used to grow all sorts of houseplants with my mom. There is no time for such activities these days. 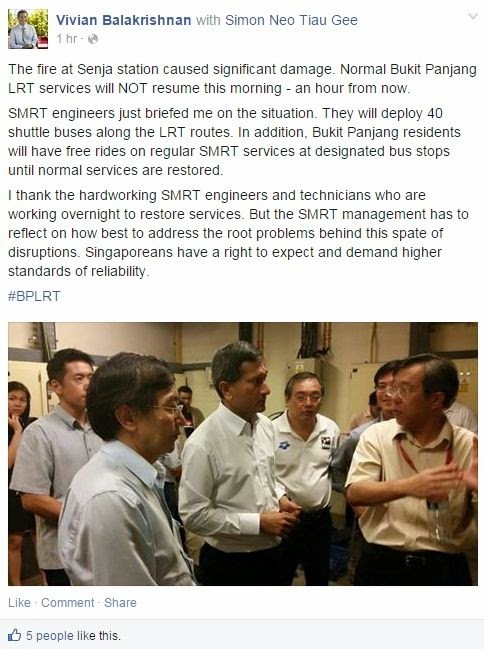 There is so much cynicism about how SMRT runs our rail system. Read many calls for LG Kuek to Hara Kiri. He has to thank Khaw Boon Wan for starting this or there would have been even more obscene and profane remarks for the LG. I am as I had blogged before just glad he is no longer CDF, Such an incompetent. Hara Kiri looks like it is going to be stickier than Ke Qiu. Khaw Boon Wan must be regretting this big time. It will even beat, "CPF is not your money". I am sure he will not hear the end of this for a very long time! When are the Hara Kiri Ts coming out? Nearer to the next GE perhaps. Hara Kiri is the ultimate but senseless apology. Fix the damn train system or else be upfront with us. Don't hide the truth from us and let the system keep breaking down. Any global CEO worth its salt would have come clean and turn customers into partners to jointly solve the problem. LG Kuek don't know or recognize what is significant damage. It takes VB to tell us eh? LG Kuek was still hopeful and giving false hope that the LRT could run in the morning. Such wishfulness each time with have a major train incident, no wonder the problems keep cropping up. Firing LG Kuek would not solve the problem, but it would clearly not make it worse either. At the very least there would be fewer calls for Hara Kiri. They are obviously trying their best to bring the LRT back into service. The minister must have already been too familiar with public anger. Commuters are right to be angry. It is not just keeping the system working but maintaining our reputation. It is nice to see that LTY receive some notes of thanks and encouragement from some of us but I feel the majority should be angry and continue to press for greater accountability and transparency. Cut the crap Tharman. The electorate has changed. Of course every budget is about elections, especially the budget. Increasingly a good budget may not be good enough. Mostly beyond taxes I don't care for the budget especially when you return money to us. I rather we be taxed less and I am most unhappy when I got from Donald Low's article a better idea how conservative our budget is and yet the PM repeatedly spoke of raising money from us to fund social programs. It is good, very good to be conservative financially but it also imperative to defend that conservatism. For many years until 2011, many families with sick and elderly folks pay a heavy price from this government conservatism. You should know even as long ago as when you were still in school that the electorates never believe in free gifts. We will always ask how they are paid for. In the end government largess can only be small and big giveaways are not doable and might even lose you votes. Whenever the government is giving out large amounts of money, it is just acting long term in the hope that they will return to the budget as more taxes from its success. It is a loan or venture capital to industry by another name. That is why schemes like the PIC are far more generous that the Silver Support scheme. It also explains why they are prepared to lose some money and even endure a little cheating. That is how investors think when they make bets. Sadly such entrepreneurial programs in our current environment cannot create many good jobs even as they help to make a tiny few very successful. People here want to work hard and also have work life balance because working life is a marathon not a sprint. We want interesting and engaging work and not see our jobs put at risk from self centered and short term thinking management. Definitely we will not accept having foreigners turn us into second class citizens and turn us into something else. A budget and policies that give us good jobs and manageable cost of living, a sensible national security system, most other things are negotiable. Sure, healthcare, education, transport and the environment are very important but we can be innovative with those. Those who commented on the Today article are in a sense right that this budget is not a vote winning one for many. We will not negotiate about good jobs and cost of living but keep looking for anyone else with proposals to do better. To me that somebody else definitely do not include the SDP. Theirs are old spend and spend ideas dressed up as new. The will bankrupt us. Excellent, Mr Heng is going to change direction with Education. I also notice Tharman's finger prints on this change in direction. This is about shifting from a meritocracy of paper qualifications to a meritocracy of skills. The idea is right and simple but making it happen is very difficult and politically risky. Finally seeing some good old fashioned political courage. Throughout my kids' education we have had to sacrifice grades for real learning than exam smart only. One of the costliest price was in EL. In primary school, I insist they must write in short sentences when the school was doing the opposite. I told them to avoid big words and use simple everyday ones. They were disadvantaged but I thought it was worth it. By the time the elder child got the the A levels, her PW written report was used as a model for her juniors. Needless to say, in university the professors are always telling them to put aside their GP essay writing habits. A meritocracy of skills will refocus every student aim from looking good with As to skills that will contribute to tangible outcomes. The biggest problem is when the smarter and correctly trained young eventually knock heads with the product of the old system in the work place who unfortunately as bosses call the shots. The easiest and most practical solution would wherever possible promote the young quickly. Older bosses and workers should read the writing on the wall or get "killed" like King Belshazzar was. The billion dollar tuition industry will not go away. It will adapt and be transformed. Families will always be seeking for ways to give their children an edge over others. This is relentless. I do that too but because my view of the future differs from most, I do it differently. Never imagine because my kids are not in the rat race, we aren't in the race at all. But many things in life are more important than the race. Winning is not everything, but compete we do. 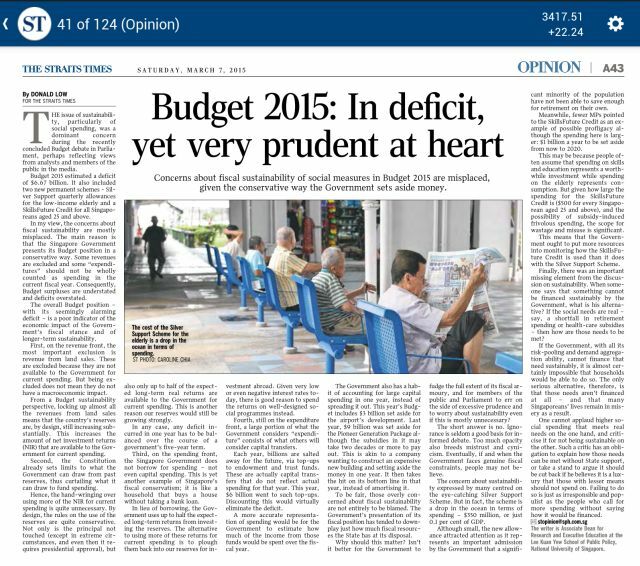 Donald Low contributed an excellent article on the Budget to the ST. 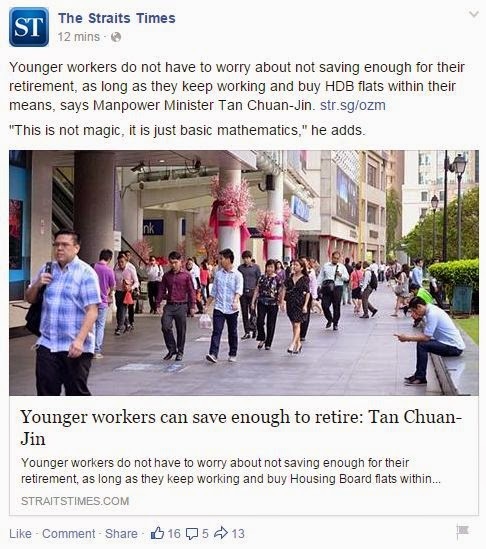 He should know how the budget work since he was a director at MOF previously. What appalled me when I recalled some of the speeches made by the MPs in the house was how they had completely misunderstood the Budget. Clearly they had failed to spend the time to understand it. They were wasting their time and ours too. As a citizen, I don't look at the intricacies of the Budget. I always knew government accounting everywhere is never as professional or accountable as commercial accounting. So if you have a bad government, they have a lot of freedom to squirrel money into their pockets. Don't need to look far, just across the Causeway would do. Think 1MDB where greed grows faster than revenue. So as a citizen it is very simple. If you threaten me with more GST I simply assume the government couldn't balance the budget without it. Beyond a certain point the government must understand there can be too much financial conservatism from locking up too much financial resources. How else are we to read this than we are over spending when in reality we aren't. Another government and that could mean the PAP but with different faces at a different time, steal the money and we are none the wiser. You just need MPs with misplaced priorities who fail to do their homework to make it easy as pie for the evil ball to roll tomorrow. Our MPs pay attention to the less important but visible aspects of their duties but ignore the far more important but less visible items e.g., the Budget. Now MPs have become like those lowly paid workers except that they aren't, and you have to watch them to make sure they are doing their jobs properly. To be able to trust our MPs is part of the Singapore premium so that we can busy ourselves more with our careers. Now that is no more. I often disagree with Donald Low but this time he has done a very good deed pointing this out to us! And double confirmed we need more opposition MPs in the House. 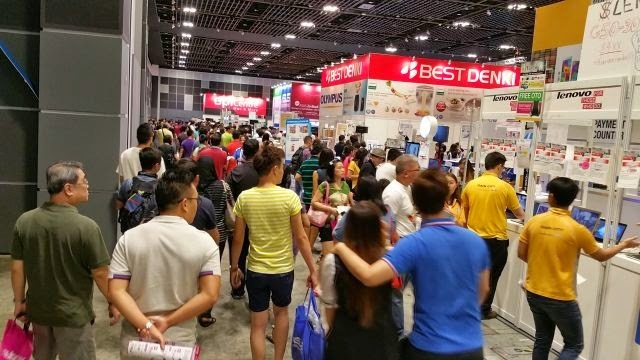 Budget 2015 and beyond: Beyond Temasek?